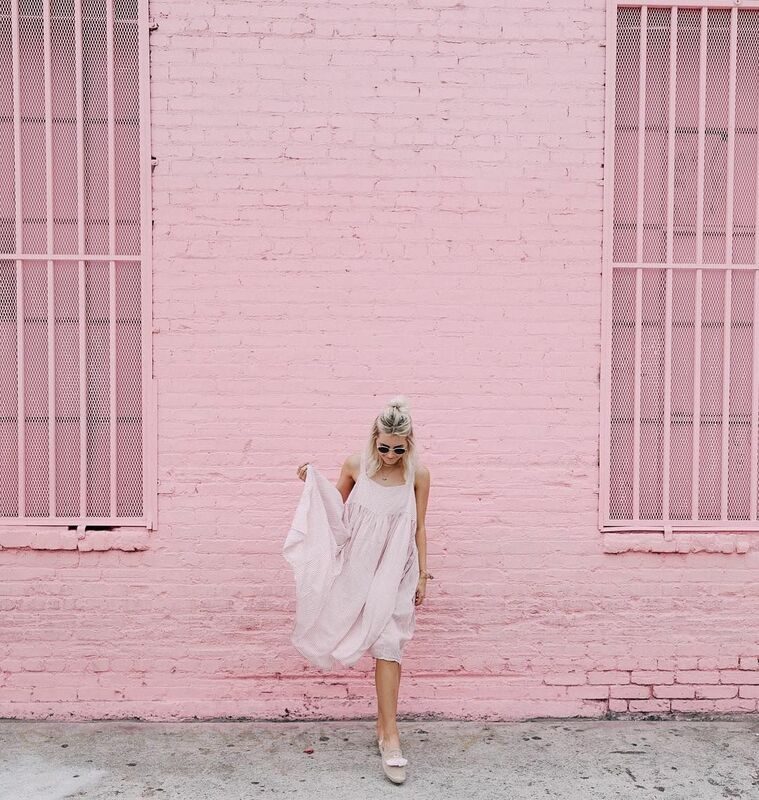 Is it just us, or did somebody paint the town Millennial pink? From billboards to pizza boxes, this creamy blush has been ruling the worlds of fashion and design. And when the cool kids are wearing it, the cool restaurants paint their walls with it. Millennial pink, which falls somewhere between grapefruit and apricot on the color spectrum, is the color of the moment. 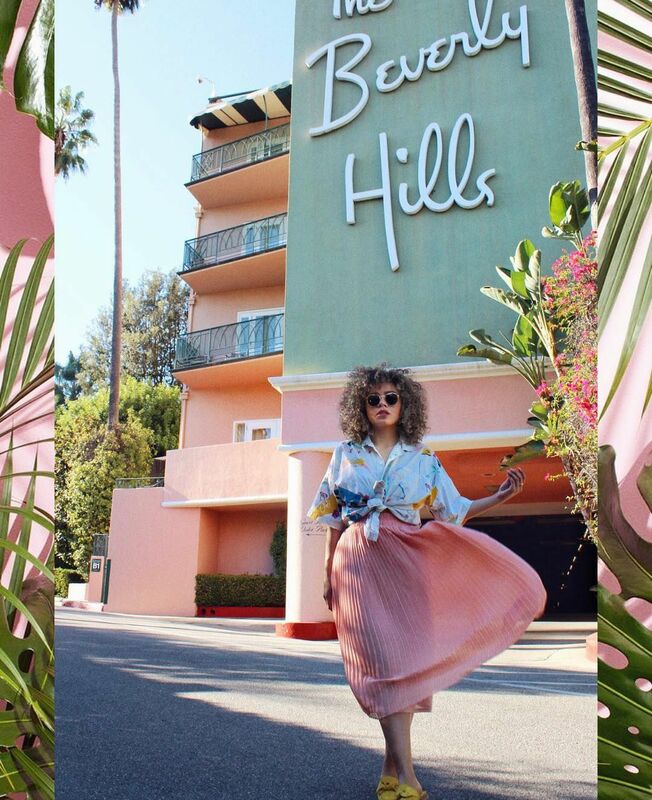 We tracked it down in museums, hotels, restaurants, cafes, bars, galleries, stores and salons in Los Angeles. Few places can rock this hue better than a museum entirely dedicated to bringing you back to the flavors of your childhood. Bask in the color while swimming in a pool of sprinkles! 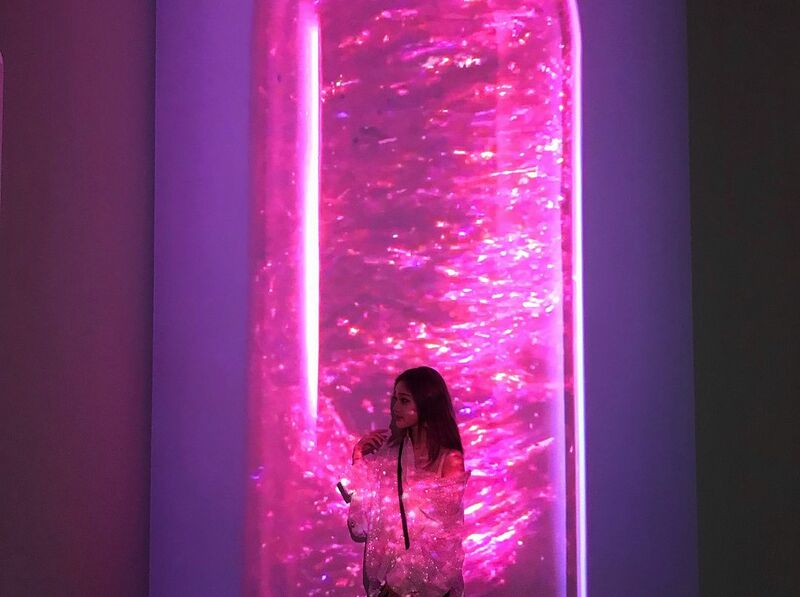 Check the Museum of Ice Cream's website for updates as they will soon be relocating. 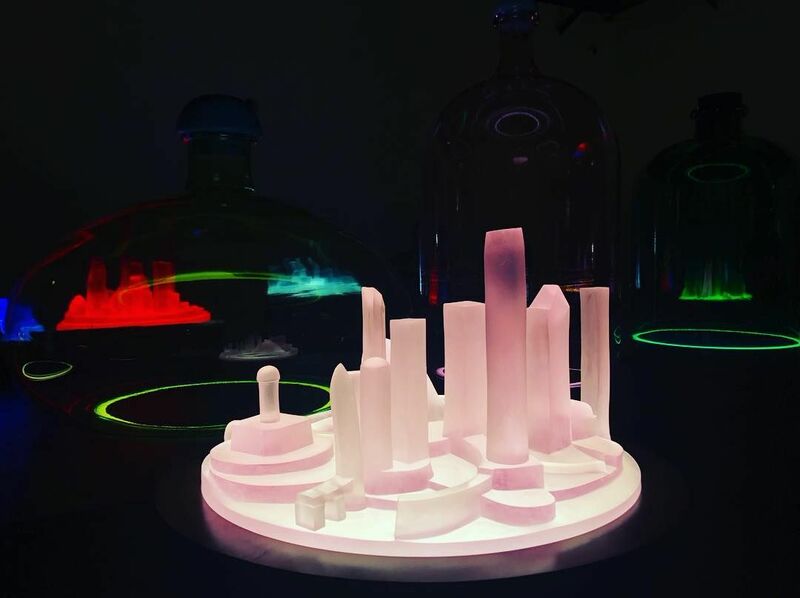 Step into the popular American comic book by way of Hauser and Wirth's current exhibition, Mike Kelley: Kandors 1999 - 2011. Revel at illuminated cities, handblown bottles and complex sculptural installations with video narratives depicting Superman's birthplace. Don't forget to get the shot in front of the floor-to-ceiling, vibrant pink post-apocalyptic sculptures. 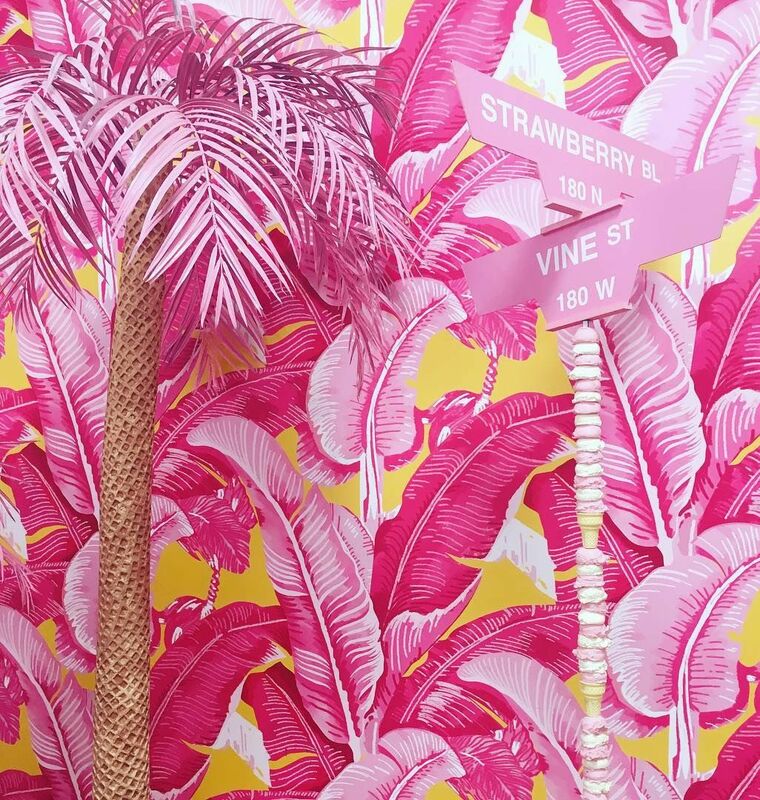 The always-classy and never-trashy Cabana Cafe has been ahead of the pink trend since the 1950s. 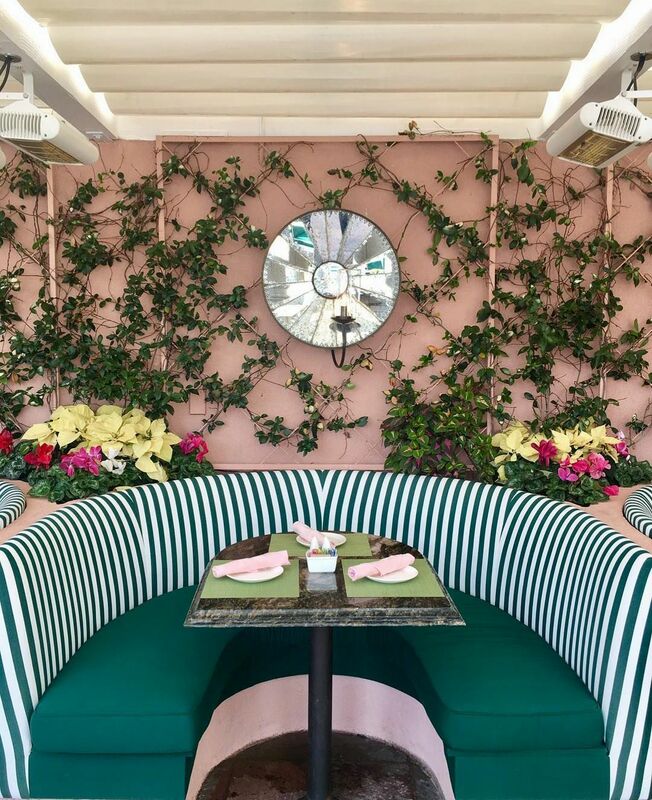 The Beverly Hills Hotel's storied cafe pairs Millennial pink with deep greens for a classic, vintage feel. Perfect for a bougie brunch in your Sunday best. 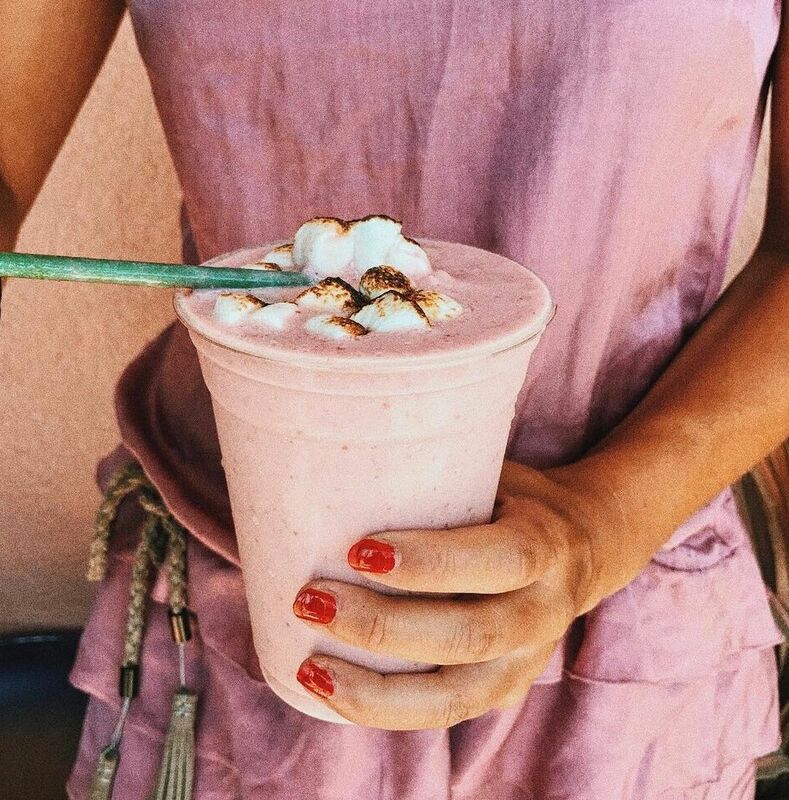 Channel your inner Barbie with the Candy Raspberry Milkshake at Le Mervetty. 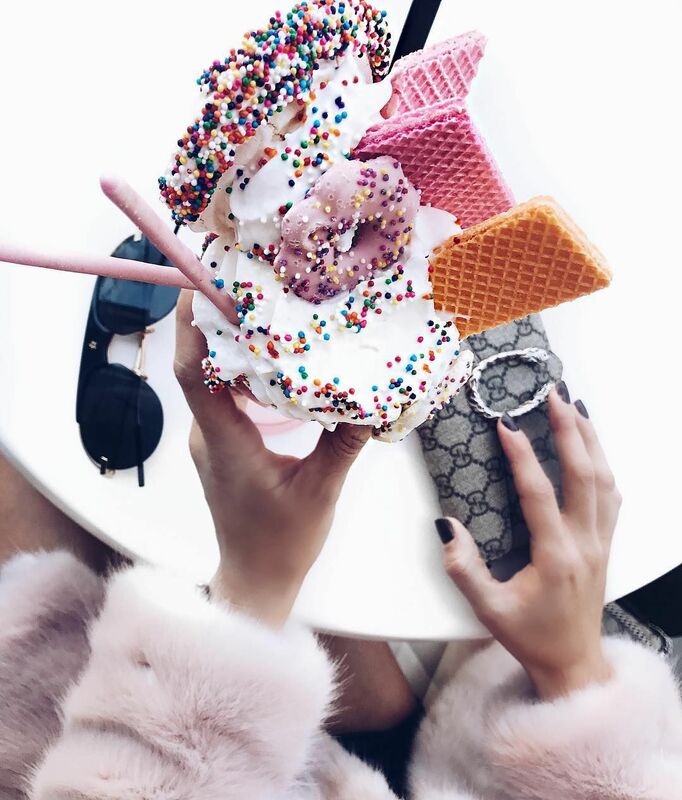 Stacked with whip cream, sprinkles and frosted pink cookies, this milkshake is begging to be scheduled into your next cheat day. Craving delicious, loosen-your-belt Southern comfort food? Head over to The Hart and The Hunter inside the Palihotel Melrose for butter biscuits, pork hash, fried green tomatoes and more. 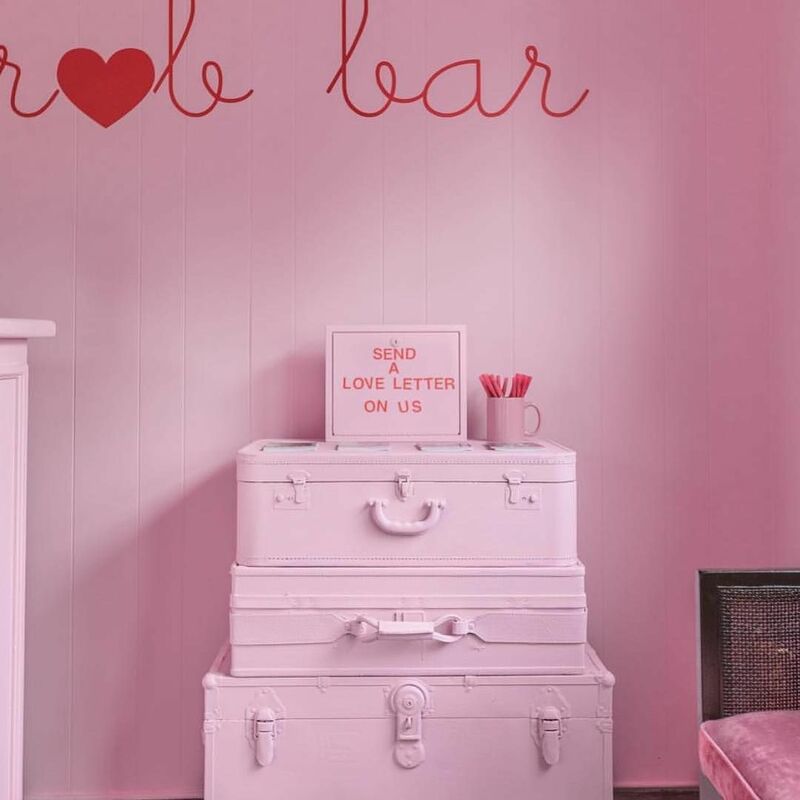 Oh yeah, the decor is entirely decked out in pink. Between the roses hanging from the ceiling to the pale pink lover letter station adjacent to the velvet pink couch, this place offers prime pink for the photo taking. Don't forget to indulge in a glass of frosé. Alfred Coffee's trendier little sister Alfred Tea Room lies tucked away on Melrose Place in West Hollywood. 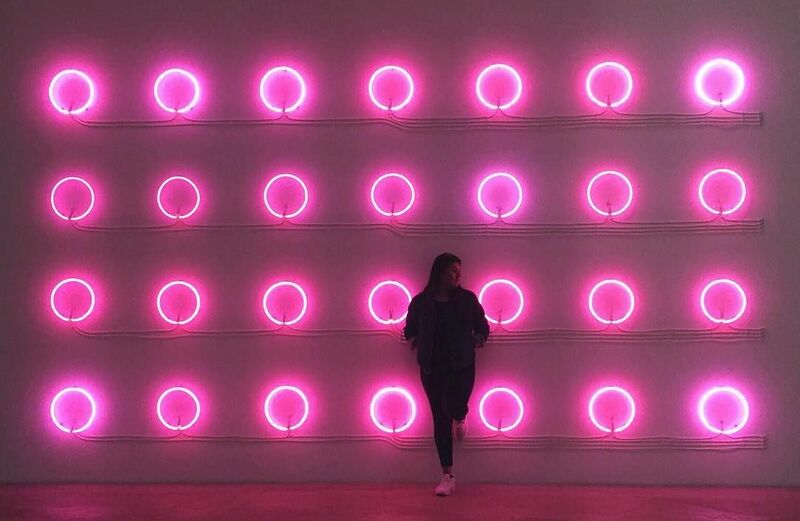 Once you step through the door, you're engulfed in pink. 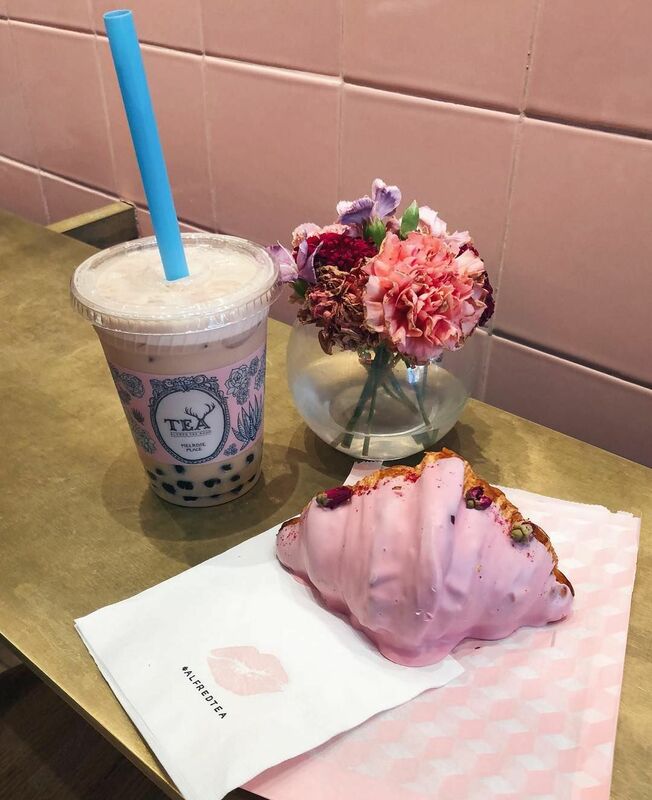 From the pink tiled walls to the neon lights and interior decor, this tea room is absolutely adorable. Don't forget to pack your plastic as only credit cards are accepted here. 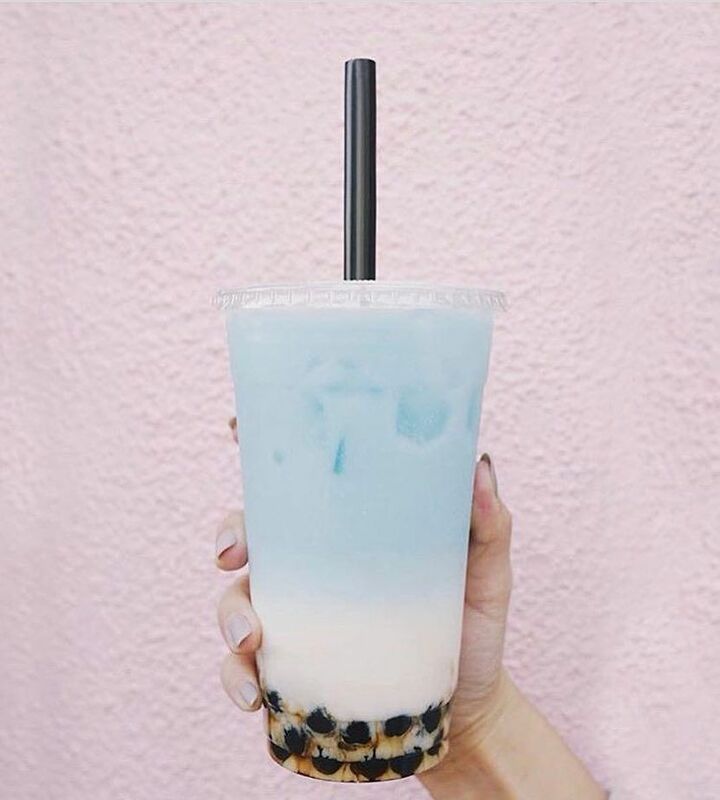 Pink isn’t the only color this Fairfax boba tea spot loves. The signature "Rainbow Drink" AKA orange yuzu, is layers of blue, purple and orange. For once, we can say it tastes as good as it looks. 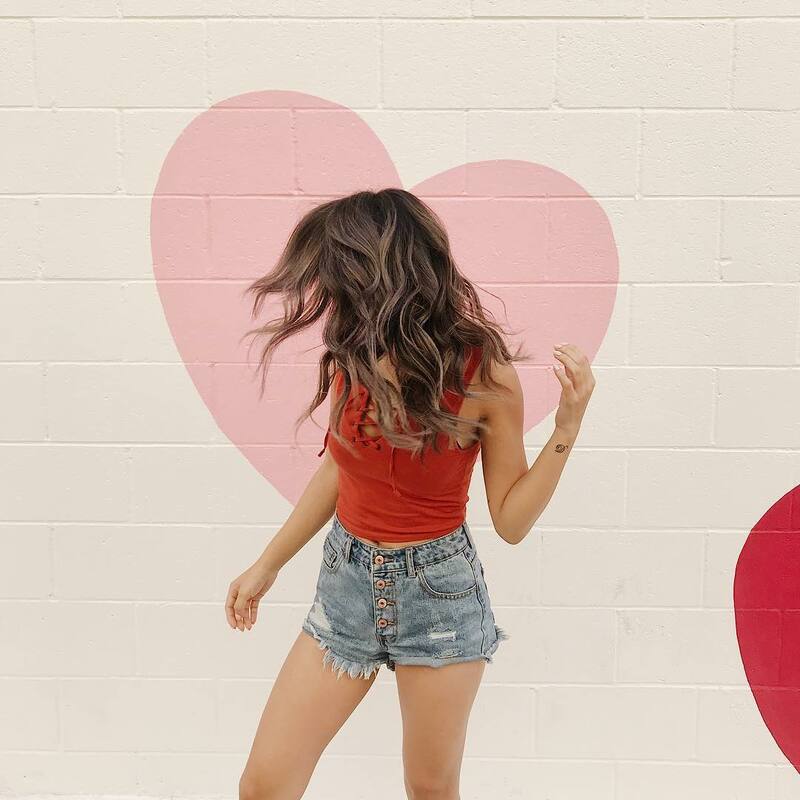 Across the street from Paul Smith's iconic Pink Wall is a mural of kisses welcoming you to Carrera Cafe. The pièce de résistance here is the freedom to add an image of your choosing onto your drink’s foam. Download the app and pick your favorite picture ahead of time for optimum enjoyment. Prepare to go back in time as you step foot in ACE Gallery Los Angeles' old-school freight elevator. Discover a variety of unique and eye-catching art displayed on the walls. Admission is free to the public, so you're out of excuses. 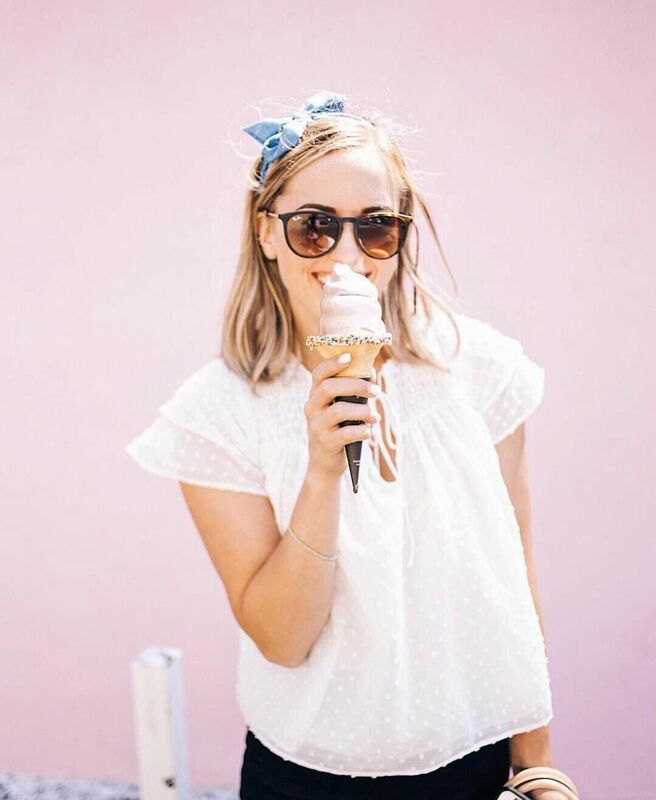 This cute pink building is hard to miss, especially with all of their colorful sprinkled cones on display. Ascend the stairs to uncover a variety of yummy Asian fruit-inspired flavored ice creams. Shoutout to the dragonfruit lychee taro swirl! So sweet and special, you won't regret it. Stacked with KAWS art on rosy walls, CREME screams Japanese delight. Treat yourself to the rich taste and smooth texture of Japanse milk soft serve. The spoons here are rightfully modeled after mini shovels, so get to work. 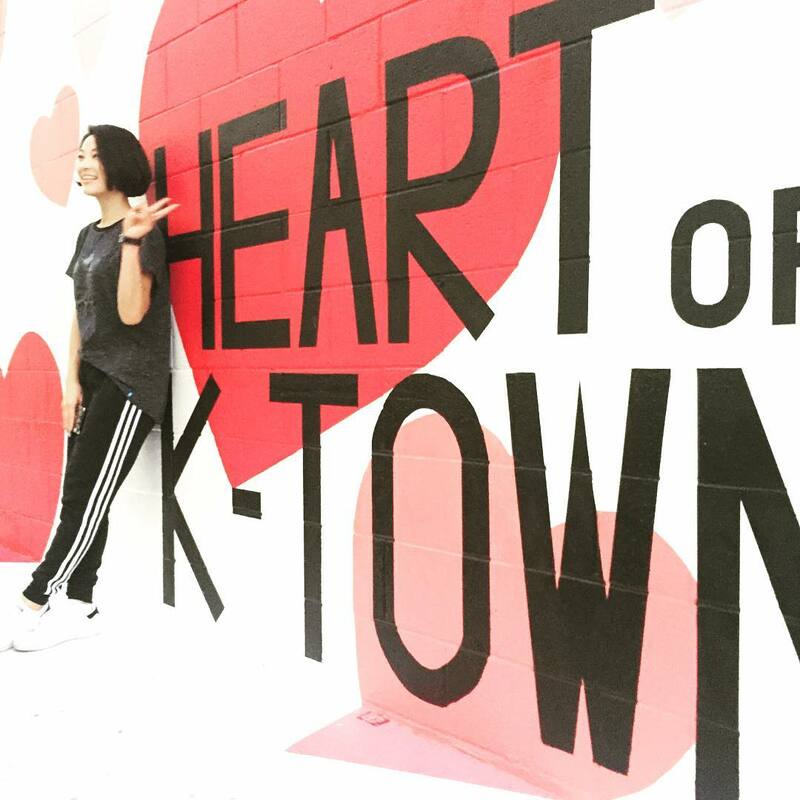 Located in the heart of Koreatown, literally, is a mural of pink hearts decorating the side of Ssooniestyle salon. All of the stylists here are super-friendly, efficient and mad talented. Ask for anything, from a model mullet to an ombre highlight job and you'll leave looking like a superstar. 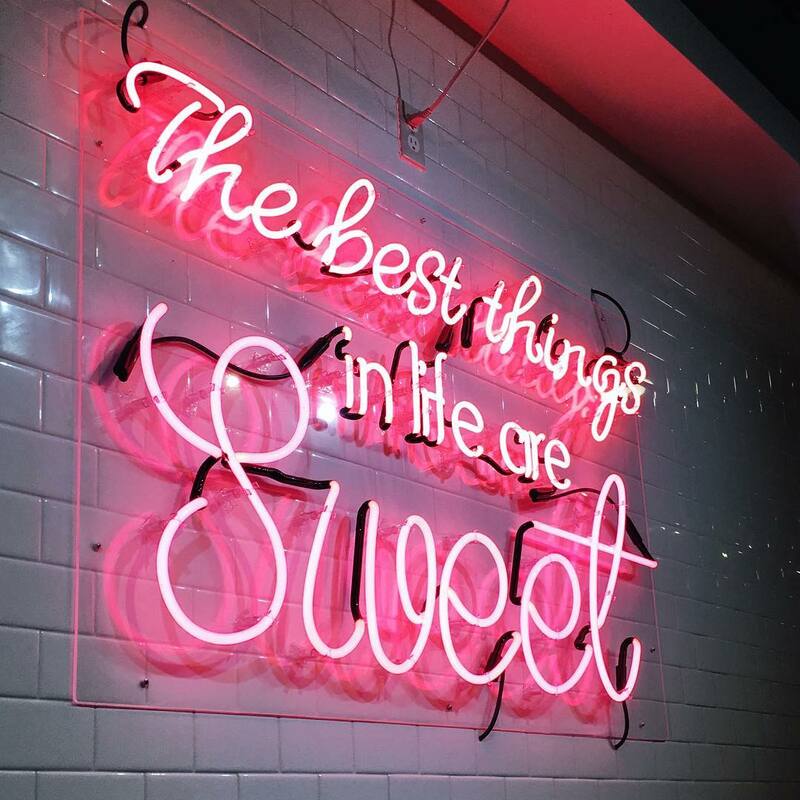 Hot Hot Food's comforting pink exterior and giant neon sign are sure-fire ways to capture our attention. 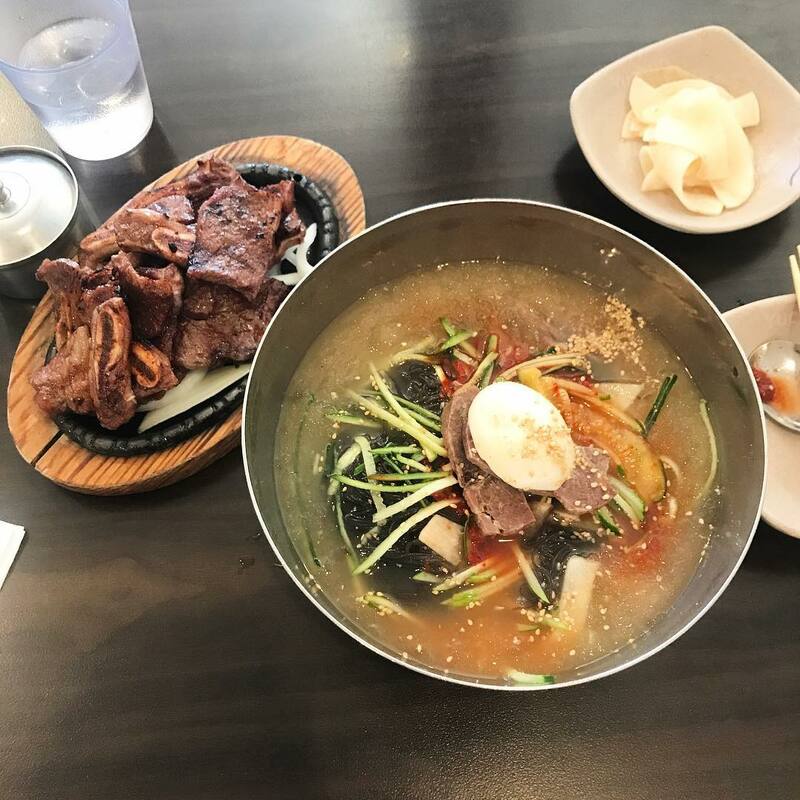 The dishes here fall into the realm of Mexican-Asian-American cuisine. You must try the Chili’N Rice, beef brisket and hominy chili smothered on LA fried rice. Salivating yet? Try the Big Papas, crispy smashed potato cakes with spicy organic ketchup. Don't forget to BYOB! Sometimes when life face palms you to the ground, a makeover is exactly what you need to rediscover the pep in your step. Head down to the Glendale Galleria where Riley Rose, a new beauty store by Forever21, is serving up Barbie realness. 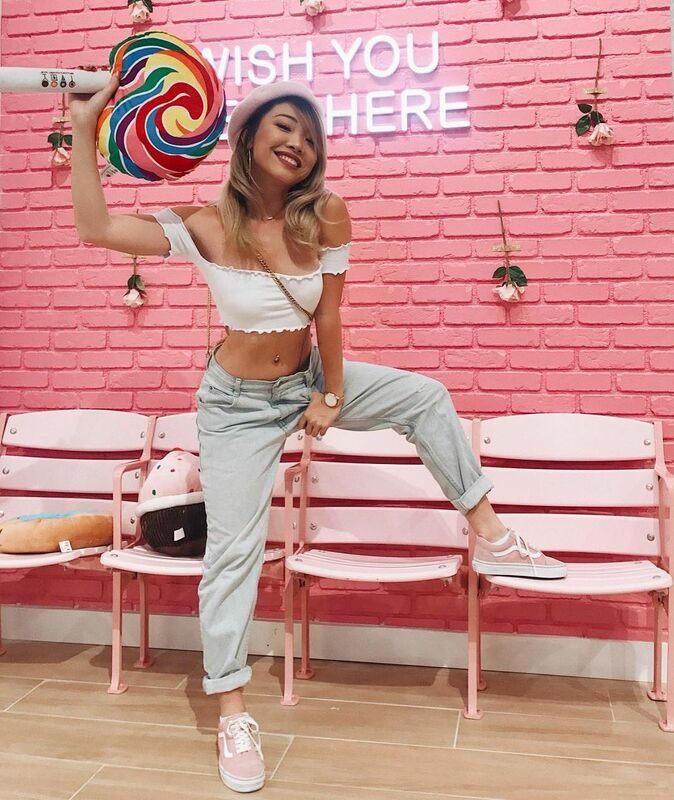 Take a seat at one of the chic, pastel pink makeup counters get your face did before having your mini photoshoot in front of one of the pink Instagrammable walls. Salted cheese foam to top your tea? Yes, please! If “cheesy foam” floating on top of your beverage makes you feel a bit uncomfortable, there are a variety of non-foamy options. Either way, this place sweetens up your life. 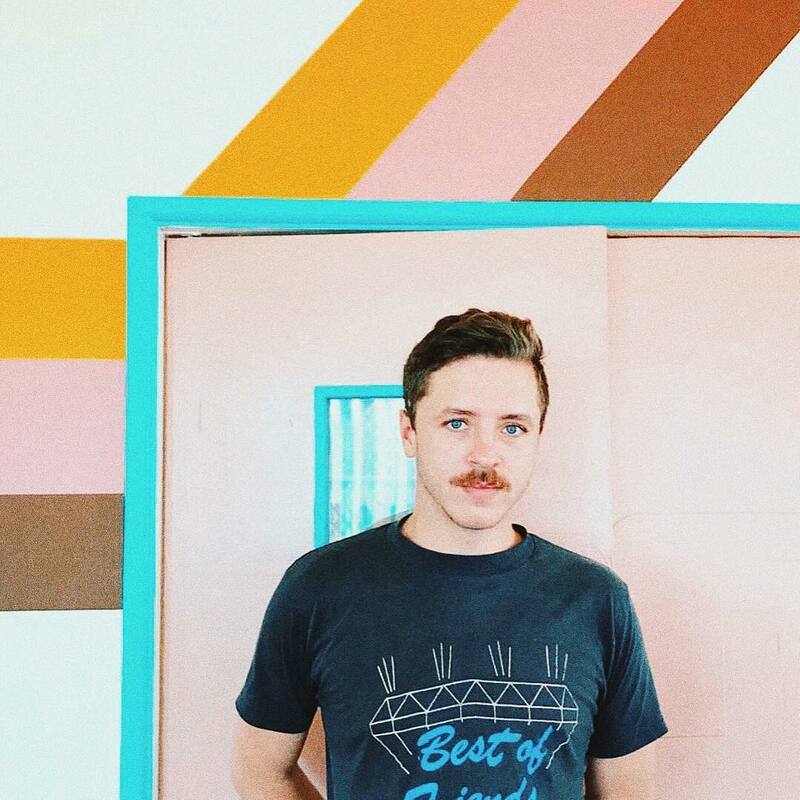 Look just east of the 101 for a super gay coffee shop dripping in pink, pastels, positive vibes and a disco ball above the front door. Cuties serves delicious pastries, doughnuts and carefully crafted coffee drinks, but the owners’ main goal is to have all customers (and their furry friends) feel safe, welcomed and accepted under their rainbow awning. 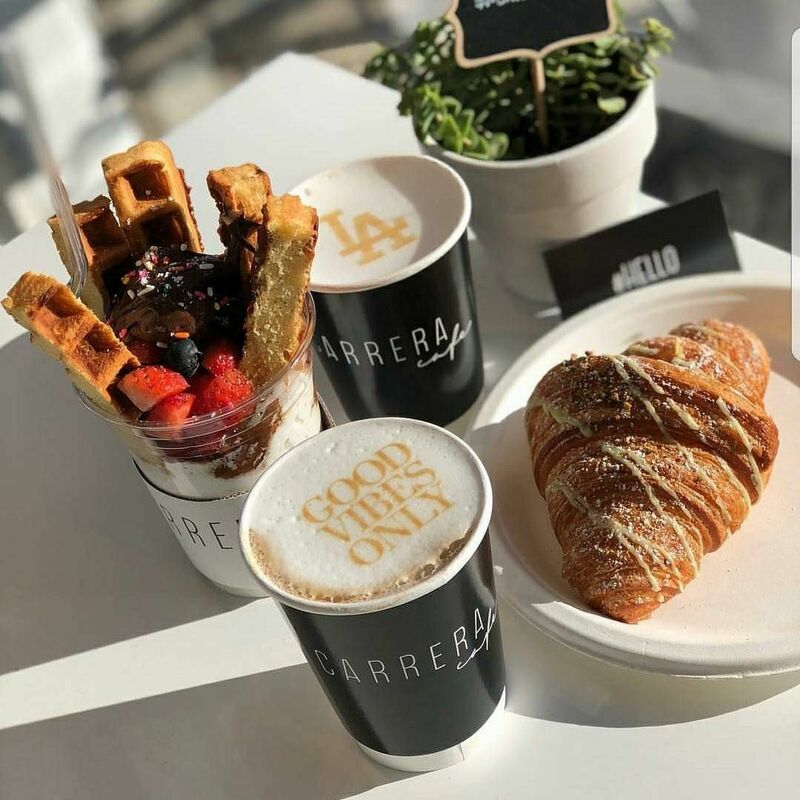 Simple European-style cafe with a patio offers coffee, waffles, crêpes, panini, smoothies & more. Stacked with KAWS art on rosy walls, CREME screams Japanese delight. A salon in the heart of K-Town. 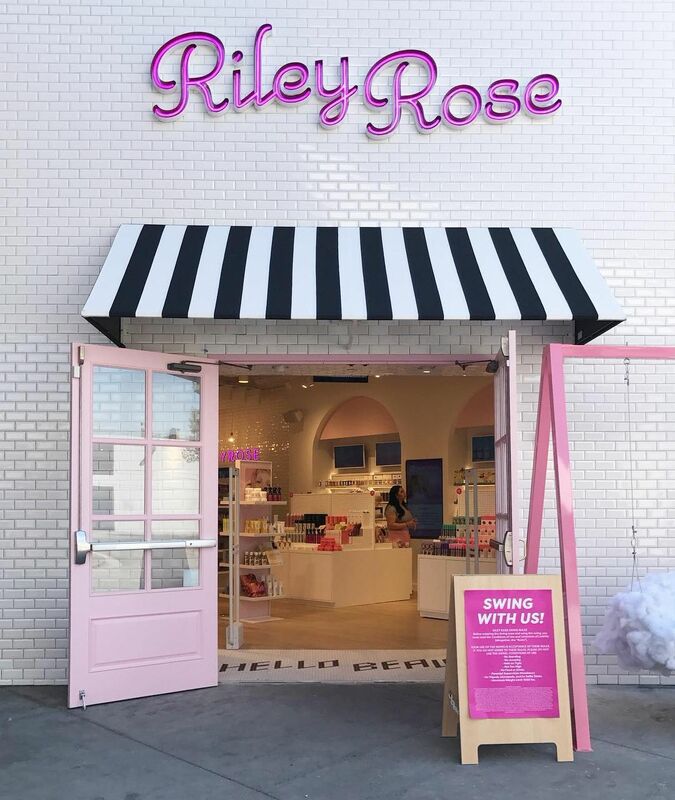 Riley Rose is a beauty and lifestyle universe where play, discovery, and self-expression are celebrated. Look just east of the 101 for a super gay coffee shop dripping in pastels, positive vibes, and a freaking disco ball above the front door. 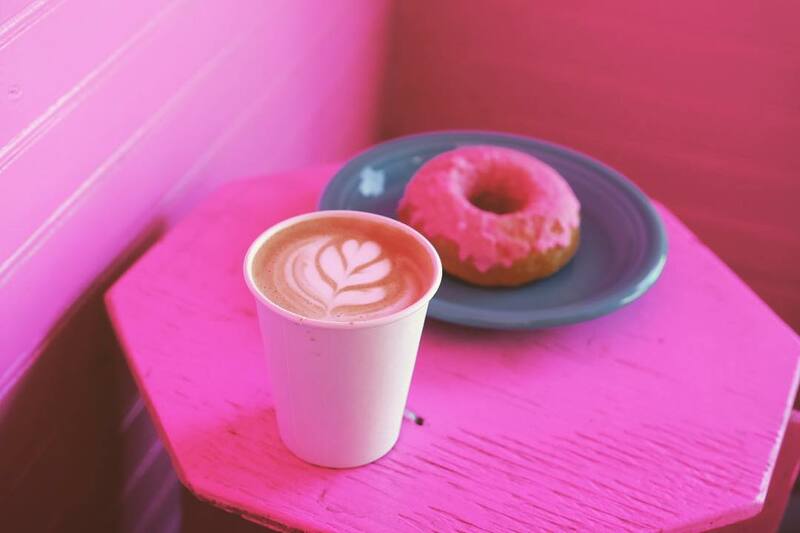 Cuties serves delicious pastries, doughnuts and well-crafted coffee drinks, but the owners’ main goal is to have all customers (and fur babies) feel safe, welcomed and accepted under their rainbow awning - great for brunch! The Original Merveilleux French Patisserie in Beverly Hills. Offbeat boutique hotel with eclectic rooms, Southern comfort-food dining, Thai massage & free WiFi. 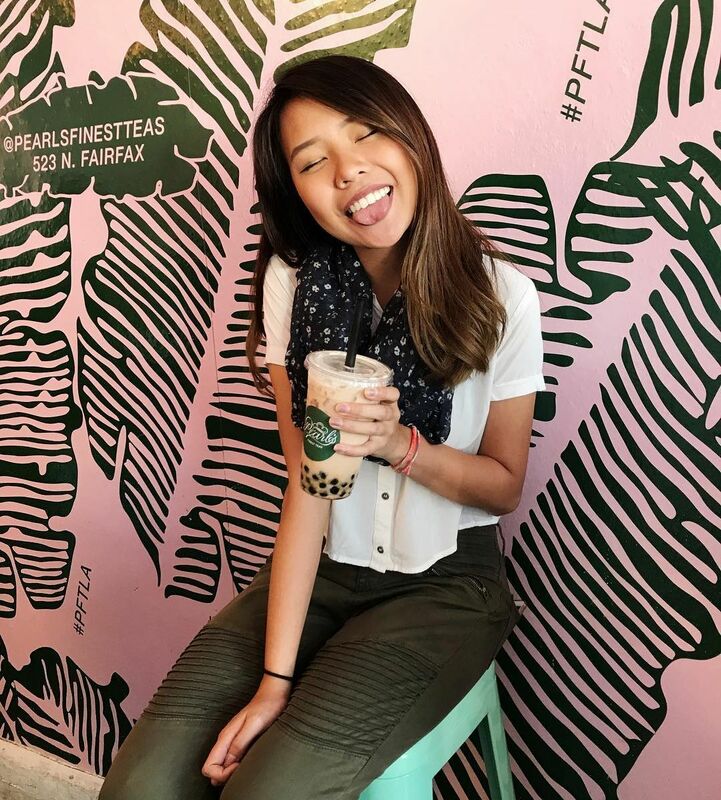 The neighborhood's first upscale tea shop, with Instagrammable beverages fitting of the area. 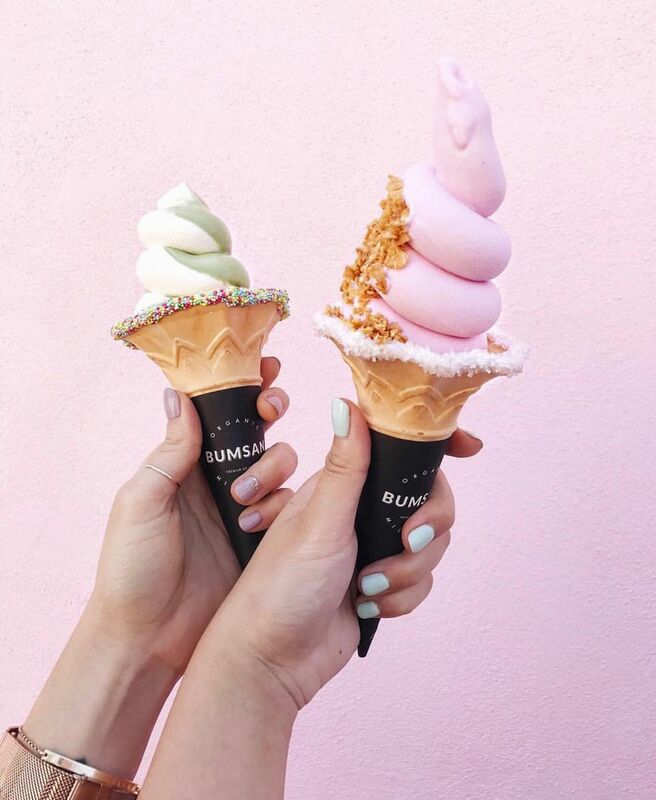 Bumsan Organic Milk Bar serves premium 100% organic soft serve ice cream from the leading organic dairy producer in Korea.